grape: Riesling. I love spicy food, and there is one wine and one wine only that I want with spicy food: Riesling. 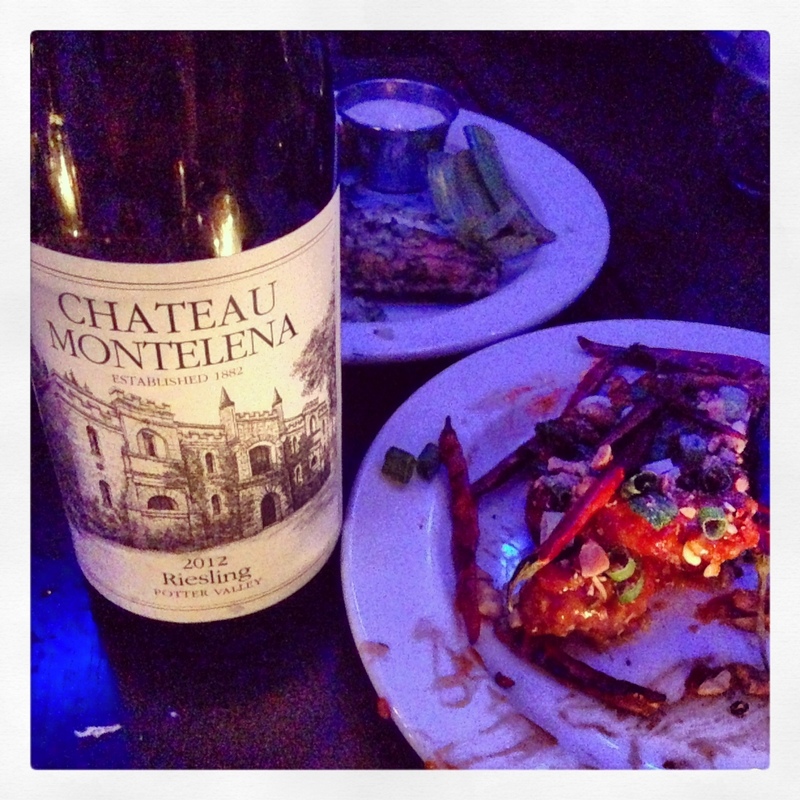 producer: Chateau Montelena. I didn’t even know they made a Riesling, because they’re incredibly famous for their Chardonnay that beat the French in the Judgment of Paris in 1976. But I loved this Riesling! yum factors: Very light and the perfect amount of sweetness – not overpowering, just there for balance. It’s not as searingly acidic as German, or Alsatian Rieslings which I love, but this is like a more gentle, more floral version of it and still really, really delicious. food pairing: Kung Pao chicken wings at The Monarch in Chicago. You’re all into the wings’ spicy, crunchy deliciousness and then kung POW! Like an explosion you get the Riesling’s slight sweetness, acid and the wing spice all being amazing together. Tags: chicken, chicken wings, dinner, food, food & drink, riesling, wine. Bookmark the permalink. Agreed. That, and their zin are fab. Under-the-radar goodness. Haven’t had their Zin either – only the Chard and Cab. But will seek it out now that this Riesling was so good. I didn’t know they made a Riesling either! Now I finally know what wine to have with spicy food. Thank you, this is wonderful, as I am usually at a loss for what to drink when I eat spicy foods. YUM. Let me know how it is! I never really had wine with spicy food, but now I know an option. Thanks for the tip! I wrote about this the other day and agree, it’s nearly always a Riesling with spicy food although I do also enjoy a good Gewurztraminer with Thai. I like a little sweetness with Thai but prefer a dry and subtle Riesling with good acid structure to go with Indian, and even discovered a couple of reds that go with Afghan, being lighter spiced cuisine. I’m more Riesling than Gewurz, but they’re good too… Cheers! After seeing the movie Bottle Shock about this winery, I really want to visit! One of my favorite wineries. Didn’t know they had a Riesling. Great to hear about this. Thanks for the info. I’m looking forward to tasting this Riesling. Thank you for stopping by my blog and I look forward to following yours!